Stage clothes were not cheap. EJP spent at least $166 for clothes in 1886, more than $300 in 1887, more than $140 in 1888, $100 in 1892 and $290 plus in 1893. A small account book records various expenses for 1876-1877 in Philadelphia including gloves, silk $10, Lining 00.30, Rusching & Muslin, Skirt braid 00.14 and Zephyr 01.56. Learning about and seeing the quilt squares she made on train trips, using cloth from stage costumes brought a true sense of how colorful the textiles were -- even after so many years. Thanks to Allister Hardiman for these notes on EJ Phillips' photographs and 19th century clothing. The first two [Gilbert & Bacon] are nicely dateable. The first things are the sleeves. They are straight from 1885.. After that they started to puff up, which means that this picture is not later than 1885. The second things is the lace waterfall around her neck. It's called a jabot, and it evolved from the late 1870's pleated bow. Jabots started in 1880 and were popular by 1881, when they were quite restrained, simply tied, in white and full. By 1885 they were massive and spilling all the way down the torso in a lace trail until they simply went out of fashions. 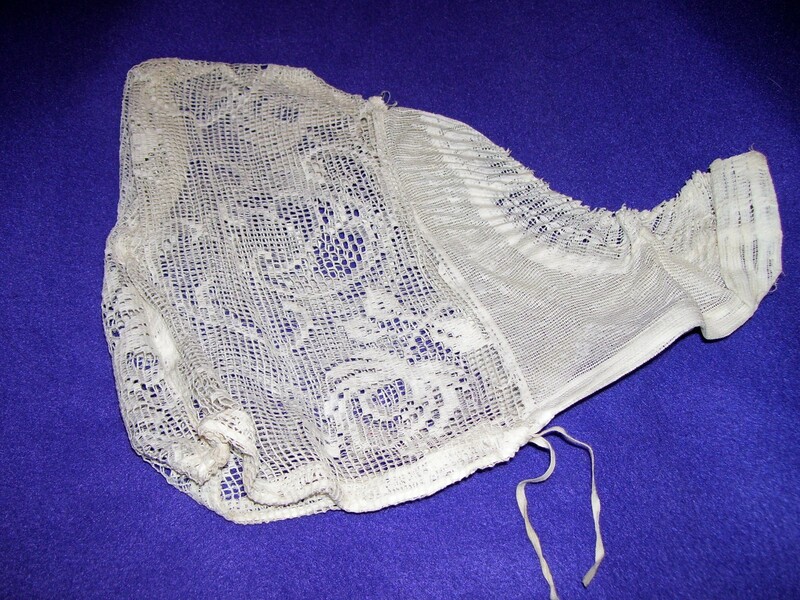 EJP's jabot here is the same in both pictures so is about [probably] 1882. because it is not so restrained, but still has large lace bits. Also, the mid length portrait with the rolled up chair arm is a dead giveaway. That's the 1880's for you. 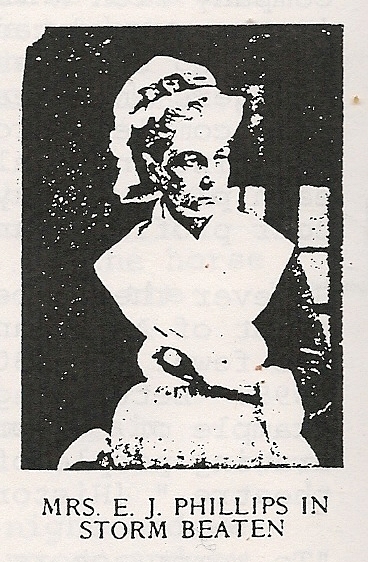 A 1934 Swarthmore Players Club program of The Rivals thanks Mrs. John Dolman Senior [Hattie] for lending EJ Phillips' Mrs. Malaprop's costume, from the Chestnut Street Theatre [Philadelphia] November 1877 production. Was this that costume? 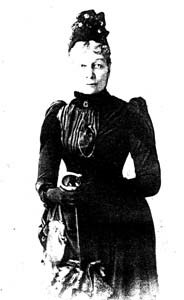 The one of her wearing the tiny hat, grey haired with slightly puffy sleeves is undated, but again the sleeves are a clue. 1885-1886 was the first slightly puffy sleeve period, then until 1896 they got bigger and bigger until they were balloons! The sleeves then went back to the second period of slight puff, which was approximately 1895-1901. The dating is likely 1895. I can't see that hat trimming properly, so can't date the hat, although the tiny dignified style certainly fits the date. Fabric "from a dress made by Olimpe, Canal Street, New Orleans"
New York, April 6, 1886 I am rehearing the new part that was said to be so good. The play is weak -- and that makes my part so -- fortunately I have only one dress, but that will cost enough with wig cap, shoes &c. and dressmaker's bill it will foot up at least $50. Chicago, June 13, 1886 My dress for the new play will cost $46. I shall have two weeks board to pay next Wed, they not having presented last weeks bill yet. The two weeks salary is knocked out but when I get my things all ready for The Martyr shall then be able to help you and pay the notes to Johnson. 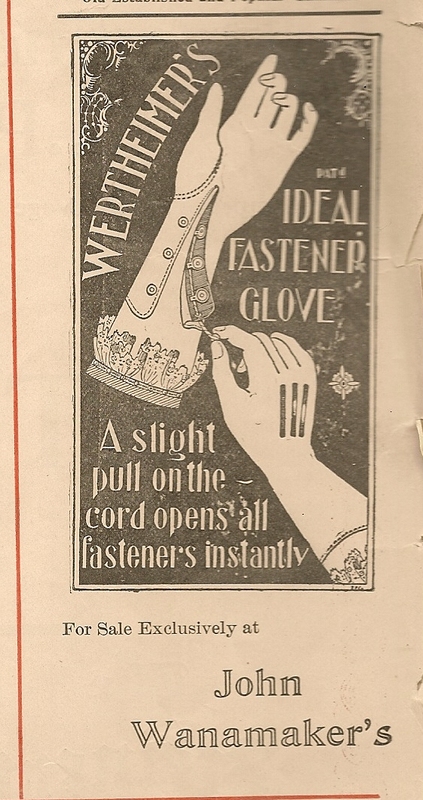 Chicago June 30, 1886 "dressmaking bill was $70, shoes $2.50, gloves, laces for caps &c I do not know how much more"
Boston Sept. 7, 1887 I am tired of the play [Jim the Penman]. And I suppose we shall be required to find new dresses for the opening of a new season and that I do not like - especially as two or three other plays calling for lots of dresses are to be produced. Boston, Sept. 28, 1887 I want to get some clothes for the Winter and shall have to buy a great deal of stuff for "business" clothes. New York, Nov. 13, 1887 To make things worse the play [Cazauran's Martyr] has not "caught on". It cost me $200 exclusive of one dress I got for the part in Chicago a year ago which cost me $50. So it has cost me $250 and the play will be taken off in two weeks. New York, Jan 14, 1888 You should have been more careful about your feet. Did those socks fit you? If not, give them to someone they will fit, and I will send you some larger ones. Are your underflannels warm enough? I wish you would be a little more communicative in your letter concerning yourself. Have you paid the tailor entirely for your suit? I have not bought a new dress for the new Play, but getting three I had retrimmed and a new bonnet, gloves &c will cost me about $75. Thus my money goes. I am afraid it will not have a long run either, and that will mean more new costumes for another play. But it cannot be helped! San Francisco, Aug. 19, 1888 Have not had my salary yet, but had to get an advance of $48 to buy a dress for Jim [the Penman] for tomorrow night, $20 to be taken out of last week's salary and $20 out of this week's. First time I have had an advance from AMP[almer]during the eight seasons I have been with him. Perhaps he will think more of me now. New York, Mar. 5, 1890 The part I have to play in the new play is not a good one, and does not call for very fashionable dressing. I hope I shall be able to do without purchasing new material. I shall have some old dresses fixed up a little. Shall have to buy a new bonnet, gloves & small fixings. But will try to spend as little as possible. New York, Jan 17, 1892 I have a very bad part in the new play we are rehearsing, but the dress will not be expensive. That is my only comfort. New dresses &c for Jim [the Penman]cost me $100. I tell you "I have to pay to act". Philadelphia June 22, 1892 I get an increase of $10 per week. Shall have to be in New York rehearsing for three weeks before season begins. Joseph is the first production. I may have considerable travelling to do, but I can live at first class hotels as cheap as I can live in boarding houses in New York. Anyway the deed is done and I shall have to make the best of it now. 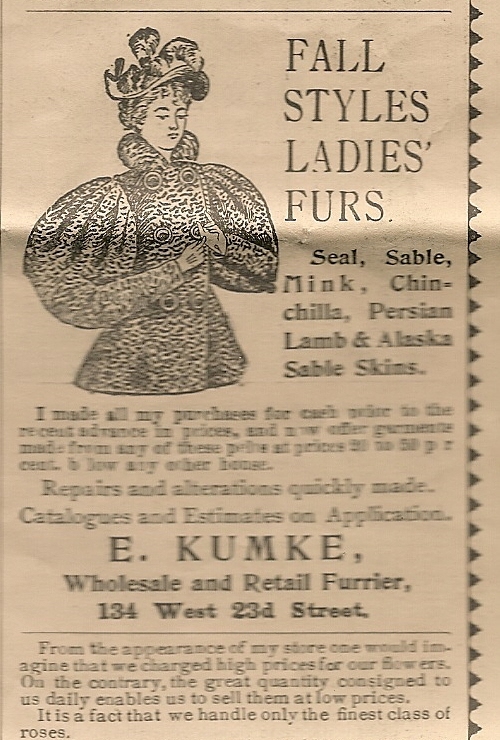 New York, Sept. 29, 1893 I have had a very busy week of it with dressmaking, milliners and shoemakers. I am expecting my dresses home in a few moments. Shoes have arrived and bonnet comes home with dresses. ... I have come to the conclusion that a woman has no right to be on the stage after she is 50. (EJ Phillips was 63.) It has cost me $290 to dress the part, without counting my expenses of board &c and all I had was $400. So you see I am bankrupt, and if my health fails, I do not know what is to become of all of us. I do not write this to annoy you dear, but I think it best that you should know the true state of things. You can keep it to yourself or tell Neppie just as you feel about it. 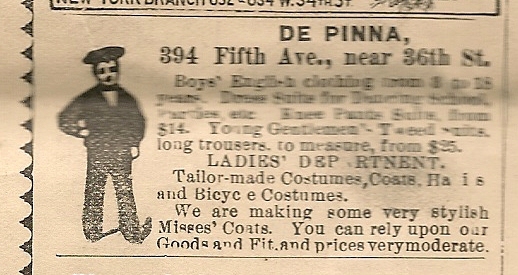 Philadelphia May 5, 1895 We are busy getting the Marquise wardrobe (for the play Caste) ready for the 13th and are trying to do it as cheap as possible. EJ Phillips' account books from the 1860s and 1870s have some information on what she spent on costumes and clothes. 1872 March 2 Paid Mrs. Fay eight dollars for Astrakhan Sacque. This would have been a fur trimmed jacket Astrakhan is fur from fetal or newborn lambs from Central Asia, also known as Persian lamb. She also recorded spending on gloves, rouge and powder (55 cents in September 1873) ruffles and silk, buttons and needles,and cambric. crinoline, waist lining, corsets, bustle, jewelry and gold lace. wig front, black merino, creping curls and #3.50 to repair her watch. muslin, green and black velvet, black striped silk, overcoat, hats for both, boots and rubbers, legging [children?] and stocking. Can you match descriptions with the squares? It is harder than I originally thought. Of course all these had to go along with the traveling theatre companies on the trains. 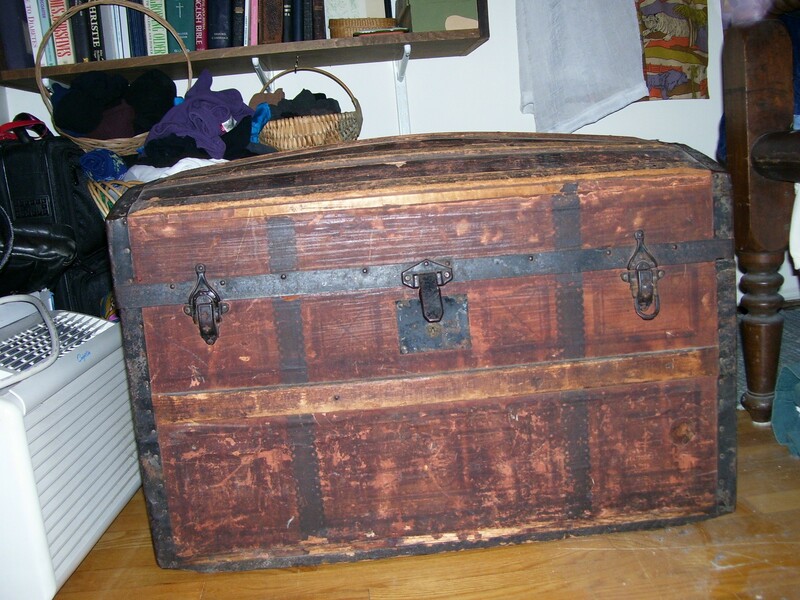 Em is getting me a picture of EJ Phillips' trunk, and the costume [child size] she has. Chicago July 27, 1887 Hope you are spending your money advantageously. Do you wear white shirts all the time now? Or do you wear your flannel shirts for the office? Boston, Oct. 1, 1887 I wrote you on Thursday enclosing $2. Glad your coat looks so well after cleaning. But how about the heavy overcoat, will that do you this winter? Your heavy undershirts, I presume will need replenishing - also drawers I suppose. New York, 10-18-95 All the new waists are very showy and plaid waists are the rage -- even trimming waists with plaid silk. 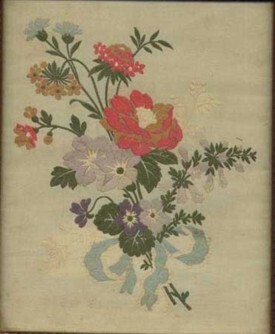 Silks of the same style as yours are very much in evidence, and are made up in better styles than some of the plaids. Theatre program ads provide glimpses of contemporary clothing. 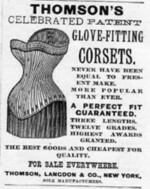 Corset ads seem to be particularly featured in those I have. Los Angeles, Sept. 19, 1888 On the 7th Hattie went to see the folks and Jack's Aunt Nellie Law exclaimed "I wish he [Albert] could see him [Jack, born in May] before I put him in short dresses". New York, Dec. 24, 1890 Would you like any more of the hem- stitched lawn? I thought you would not find much time for such fine work, and therefore sent Edward a ready made dress. I have had babies myself, and know how much time has to be devoted to them. New York, Mar. 8, 1891 I do not think it will be advisable to put Edward in short clothes before the 1st of May. It is long clothes Hattie will furnish you with for him, if you visit her in April. .. I know it is a pretty long trip for you with your bouncing big son in your arms. And if you do not feel equal in strength for the task, why do not attempt it. Washington DC, Apr. 25, 1891 Jack is now wearing kilt skirts, jerseys and reefer jacket. Hattie writes that he looks very nice in them and that "people do not mistake him for a girl". She wanted a girl but does not like to have Jack taken for a girl! Philadelphia July 12 1892 The little garment suit Jack has worn only three or four times when it was decided to put him into sailor suits so it is about as good as new. The other things he of course had more wear out of, but Hattie thought they would save you some sewing. NewPort Rhode Island, Feb. 4, 1894 March, I think, is the worst month in the year to think of changing clothes, unless you put warmer ones on. I do not think though, that the Knickerbockers would be any colder than the little dresses. Of course Ted wears underdrawers and shirts under his skirts now, but you will best be able to judge by the weather [Ted was 3 1/2 in March of 1894.] March is always a treacherous month and blows hot and cold very suddenly. And I would not be too anxious to make the change. April will be here in seven weeks. Patch up his old clothes until then and be on the safe side. Chicago, May 8 1894 I think [Ted Nickinson, aged 3] is very good-natured to wear his dresses after wearing pants. Not many such young gentlemen would do so without making a row over it. New York, 10-18-95 I looked at reefers yesterday. The prices range from $5 to $14 -- 5 years size. The young man waited on me from whom you bought the suit. He asked if you were pleased with it. I told him I had not heard. The reefers are made of heavy piled cloth -- seem to me to be too heavy for so small a child. There are some of cloth not so heavy. I am afraid those at $5 would not please you. Severa, Joan, Dressed for the Photographer, Ordinary Americans and Fashion, 1840-1900, Kent State Univ. Press, 1997. Butterick: History https://butterick.mccall.com/our-company/butterick-history In 1863, Ebenezer Butterick changed the face of home sewing forever by creating the first graded sewing pattern.